Please use Fosseway as a one-way system, entering at the Asda end when arriving to deliver or collect children and leaving via the Tesco end. Please park on the school side of the road only without blocking the entrance to the staff car park, or local residents’ driveways. Please do not park on the zig-zags. This makes busy school times much safer for everyone and allows emergency vehicles to have access if needed. 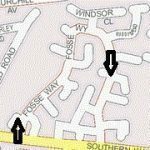 Also, would you please ensure that anyone collecting or delivering your children is aware of this one-way system.